Today’s chart looks at the percentage of electricity produced from non-carbon sources around the world. 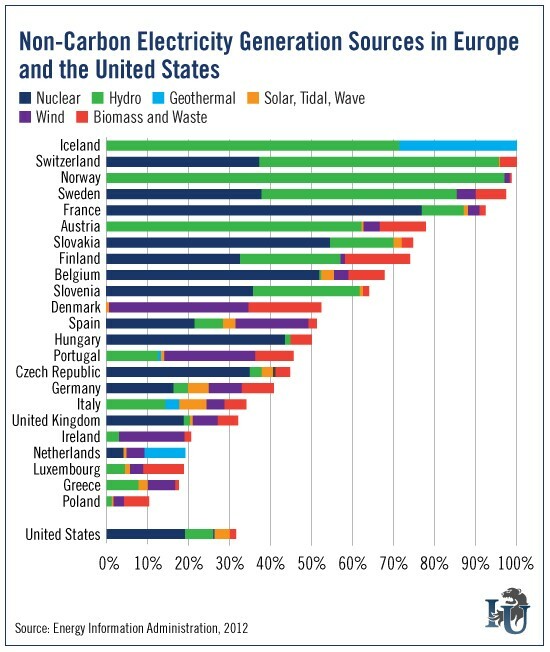 As you can see, countries like Iceland and Norway rely almost entirely on renewable sources. Other countries - like the U.K. and the U.S. - still rely heavily on coal and natural gas. Last year, these traditional energy sources generated more than 65% of all U.S. power. Still, that shouldn’t diminish the fact that, each year, our coal usage is dropping. And it’s giving renewables a bigger and bigger foothold. Changes in technology tend to happen much faster than we think. That’s the second of David Fessler’s three Laws of Technology, summed up here in Energy & Resources Digest. Often, these changes even catch government agencies by surprise. For example, in 2005 the EIA forecast that U.S. solar capacity would hit 1.2 GW in 2013. The actual figure was closer to 11 GW. Do we still have a long way to go before U.S. power comes primarily from green energy sources? Absolutely. But the upward trend is clear. And as history has proven, this shift will likely happen much faster than we think. If you’re one of the folks who think these energy sources are still science projects, think again. On March 23, 2016, more than 48% of the generated electricity on Texas’ main grid came from wind energy. Soon it will be easier than ever for end markets to access this incredible power source. The moral here: If your only energy holdings are big oil companies, you’re making a serious mistake. A well-balanced portfolio should contain exposure to solar, wind and other renewables. We just added a brand-new must-have resource to the Investment U Bookstore. We call it The Millionaire Master Plan 2016. This collection of recordings - taken at a closed-door meeting of the nation’s top investment analysts - contains the very best opportunities for the coming year and beyond. That includes Dave’s favorite plays in energy right now. PLUS: Picks from Marc Lichtenfeld... Matthew Carr... Sean Brodrick... Rick Rule... and many others. Click here to learn more.